It’s a male Carpenter Bee, I think. 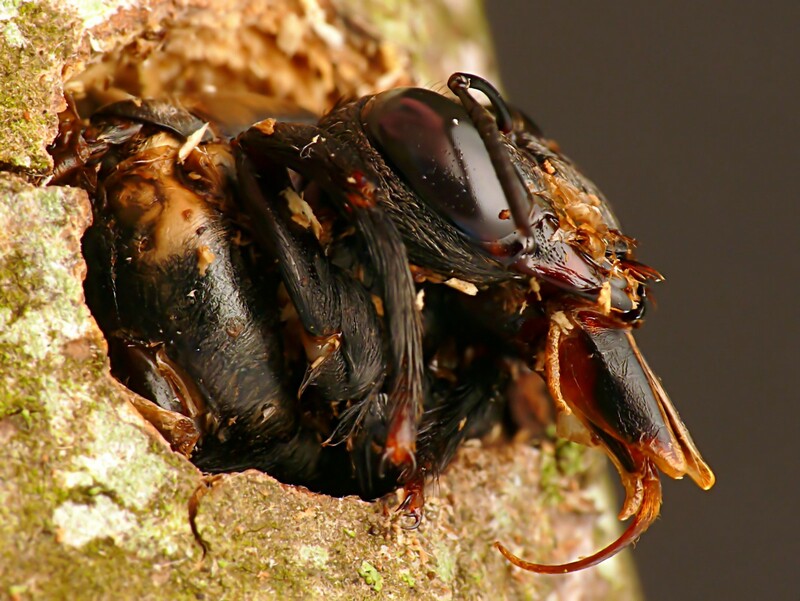 It has been occupying the nest excavated in 2013 by the female/mother – I believe – Carpenter Bee. The nest is in a two inch thick stick I had to secure to a metal rod after it rotted in the ground – soft wood. Then I built the no-till garden beds and recently, a week or so ago, sowed some seed that needed shade from the hot sun, and the shade got in the bees way of returning home – that I noticed one day, having already missed it. I doubt its little heart could survive the rigours of homelessness for long, not like people do. People, it seems, can adapt to almost anything … almost. We can usually retreat, recover and renew – if the situation allows. *And just after posting this he returned to the nest. How you get that close to the insects? do you work in studio or outdoors? Mostly outdoors, occasionally an insect comes into the house and I have to catch it. Then I might take the opportunity to get a few shots if its amenable. Very happy to read the ending. Your ‘best I could get’ would be a once in a lifetime best for me. Hi Emily. It may be the/a shot of ‘my’ lifetime too. Some things only happen once. Such a awe inspiring photo! These are amazing photos and I like the info. Here in Spain we have some very blue black carpenter bees and a wooden roof! No problems yet and no photos yet but will be inspired by you to try and capture them. Amazing pictures! Mark, you do not know the scientific name but you gave lovely name for this beautiful bee. Mark, do you by any chance know the scientific name for this species of Carpenter Bee? Down the page a bit Marc – http://www.wildlife.org.au/wildlife/speciesprofile/invertebrates/greatcarpenterbees.html – looks like the male anyway, on the right. Sorry, don’t know much about the science/names. 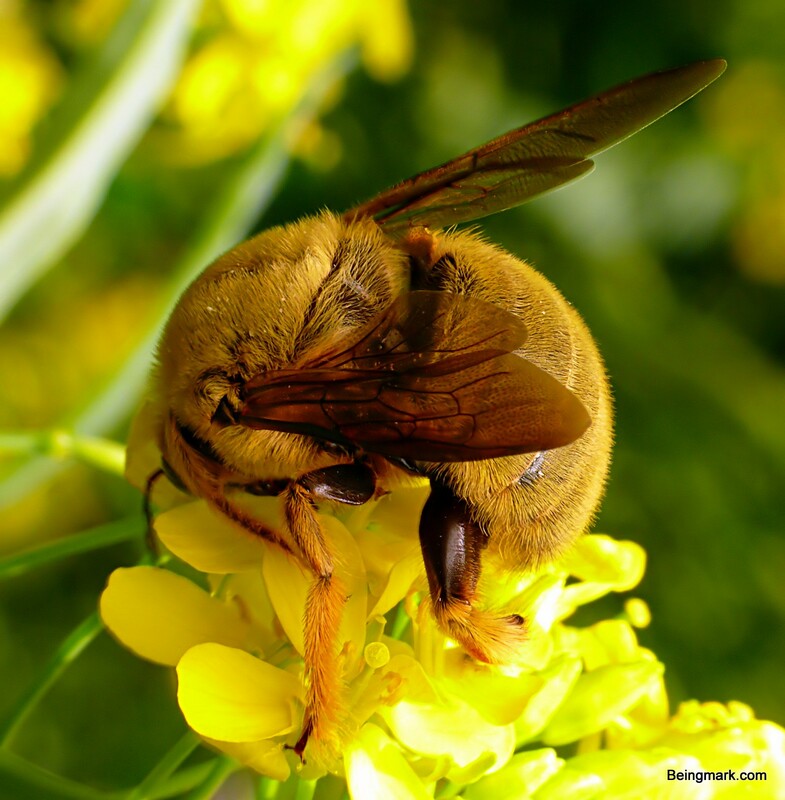 Looks like the carpenter bees do good work – as do you! They are at least as we are Amelia, resourceful. Tis our nature after all. It’s more likely a male Carpenter Bee though, just found out. Great series, never saw such a carpenter bee. Thanks. Actually, the furry one might be a male Carpenter Bee and not a Teddy Bear Bee. Thanks WG. So do I, water permitting. Just went to water some plants and there she was, checking out the bamboo next to the nest, and into the nest she went. 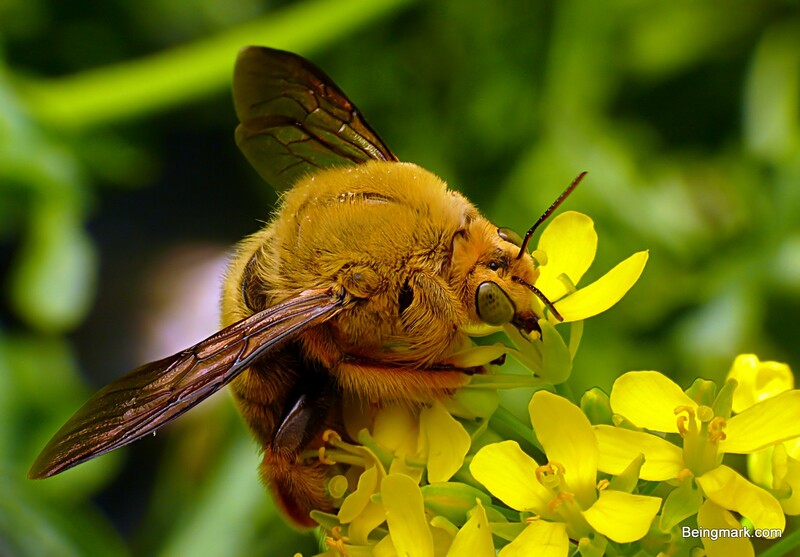 What stunning photos of the Teddy Bear Bee. So cute and mighty at the same time! Thanks M. It’s a beauty all right.